Sponsorship Opportunities | HEY! Hamilton! We have FOUR WAYS that you can help become a part of the next wave of community news and information in Hamilton! Community Partner banners will include links to business website or social media page. Calendar Sponsor: Exclusive position, Banner with link at top of right sidebar, just above the most comprehensive community calendar in Hamilton! HEY! Hamilton! posts noncommercial event notices and press releases from area organizations at no charge to them. Your sponsorship allows HEY! Hamilton! to be more responsive to the needs of the nonprofit and social service communities. Sponsorship fee includes “Sponsored by: YOUR BUSINESS” notation at the top of the post, a banner at the bottom of the post, and a banner in the Community Partnerships sidebar for one week or the duration of the contract, each with embedded links. Original HEY! Hamilton! feature stories, event coverage, audio podcasts, video podcasts and photo galleries. Sponsor is welcome to make story suggestions, or leave it to the editor’s choice. Includes “Sponsored by: YOUR BUSINESS” notation at the top of the post, a banner at the bottom of the post and a banner in the Community Partnerships sidebar for one month or the duration of the contract, each with embedded links. Supports regular HEY! Hamilton! content to promote local activities, businesses and people to give our website true local flavor and our sponsors the opportunity to help us highlight parts of the community that are important to them. Includes “Sponsored by: YOUR BUSINESS” notation with link at the top of the post, single banner with link at the bottom, mention at the top and bottom of the podcast (when applicable), single banner with link in Community Partners sidebar for the duration of the contract, and recognition in the feature’s “Exclusive Content” index. Sunday Profile: Weekly profile of a prominent, important or interesting person in Greater Hamilton. Hamilton! Daily Round-Up: A 6 a.m. daily Monday through Friday blog post with links to Hamilton news and feature stories in other local media, websites, newspapers, magazines, television and radio. This Week in History: A weekly column published on Friday for weekend reading, digging into the news from 10, 20, 50, 100 years ago–back to the founding of the Fort when possible. Cook of the Week: Each week, Karen Minelli Holcomb highlights a local cook with recipes, photos and helpful hints. This Week at the Fitton Center: A weekly 10-minute video podcast published each Monday morning, interviewing a Fitton Center staff member or spokesperson regarding coming events. Hamilton! In the News: A weekly audio podcast published Friday afternoon recapping news about Hamilton from other outlets. Hamilton! Business: A weekly video podcast published every Wednesday morning highlighting a Hamilton business. Garden of the Month: Karen Minelli Holcomb takes HEY! Hamilton! readers on a tour of a local garden, with an interview with the gardener and helpful hints on making your own backyard paradise. This Month at Miami Hamilton Downtown: A monthly video podcast published the last Friday of each month, an interview with a Miami University staff member or a presenter of one of the programs. Beat Sponsors fund a weekly round-up column and a weekly feature story (or two columns per week, in some cases), receiving embedded links in “Sponsor: YOUR BUSINESS” notations at the top of each post, a banner at the bottom of the post, and a banner in the Community Partnerships sidebar for the duration of the contract. An additional $200/week ($2,600/quarter; $10,400/year) would sponsor a second feature story on the beat. Arts & Culture Beat: Covering local arts and cultural (including historical) institutions. Business Beat: Covering Greater Hamilton business community. Church Beat: Covering Hamilton area churches and religious community. 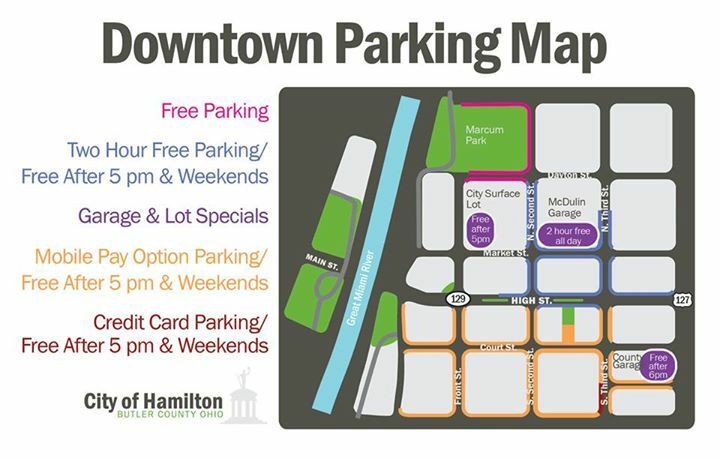 City Beat: Covering Hamilton City Government, including City Council meetings and economic development. Law Enforcement Beat: Weekly wrap-ups of police activity and court dockets. School Beat: Covering Hamilton area schools and boards of education. Society Beat: Covering Hamilton nightlife and social organizations. Sports Beat: Covering Hamilton area youth and amateur sports. Because we are setting Beat Sponsorship rates at a bare minimum, we cannot offer discounts and have a minimum contract of three months in order to accommodate contracted contributors.